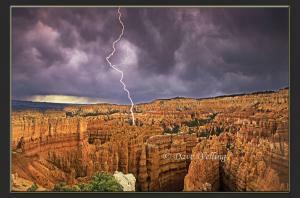 I spent several weeks one summer trying to get "striking" images of summer monsoon storms in Bryce Canyon National Park. I made several trips based on weather forecasts with no luck. Then, as the season was drawing to a close, I got lucky and captured this image from Sunrise Point. As I captured this image, the air around me began glowing with a greenish color and the few hairs I have on my head tried to stand up. I decided standing next to a tall, metal tripod in a lightning storm wasn't the smartest thing I had ever done and beat a hasty retreat to my car. But, I got the image and it is available on this site as a Fine Art Print.